Heat a non stick pan to medium high heat and toast the walnuts for a minute or two. 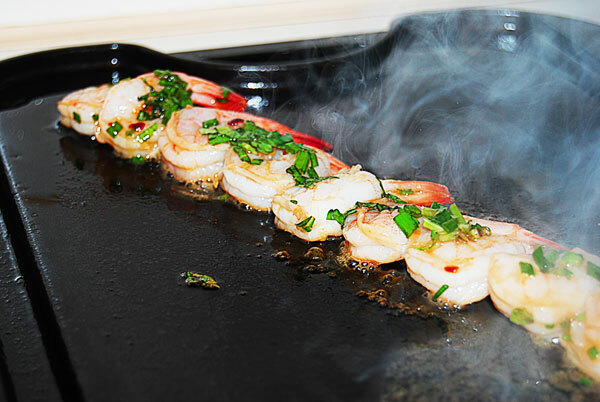 Marinade the shrimp with Vinagrette and 1 tsp ollive oil in a small bowl for 5 minutes. Grill for about 2 minutes on each side. Over medium high heat add 1 tsp. olive oil, broccoli, carrots, onion, bell pepper, garlic to a non stick pan. Pour leftover marinade over the top. Sautee for 2-3 minutes. Take off the heat and add tomatoes. 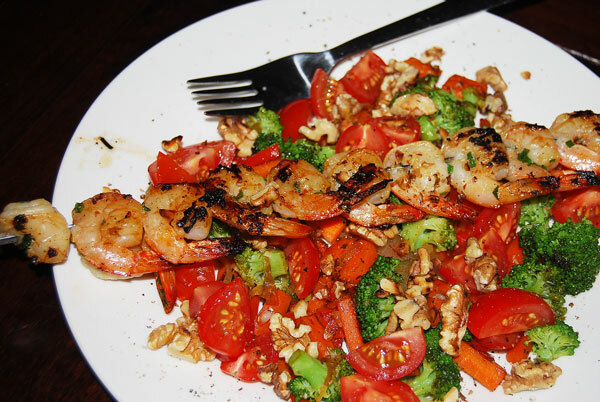 Serve the skewer over the top of the veggies and sprinkle with toasted walnuts.